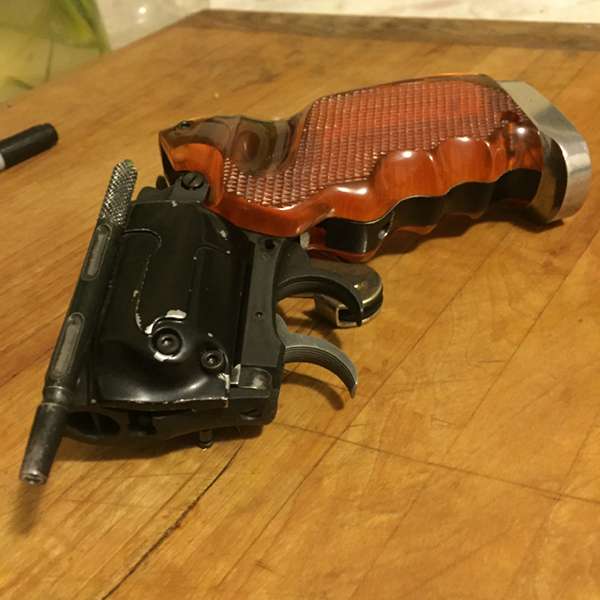 I collect plug-fire model guns, and a little while ago a company put out a Charter Arms Bulldog. Naturally I picked one up out of curiosity. Turns out, the thing is almost identical to the base of the Tomenosuke. Fits perfect! It's just missing a few mounting points, so I figured what the hell... might as well start chopping things up! The grip frame of the Tomen doesn't fit perfectly into the CAW, which is a bummer since all the mounting points for the amber scales are already on it. So I chopped up the Bulldog ones. That's after the rough first cut. After I cleaned it up, I chopped the barrel off. Here it is mocked up with a steel barrel. I bobbed the hammer, but forgot to take a close up. I did a test fire, and it still works! 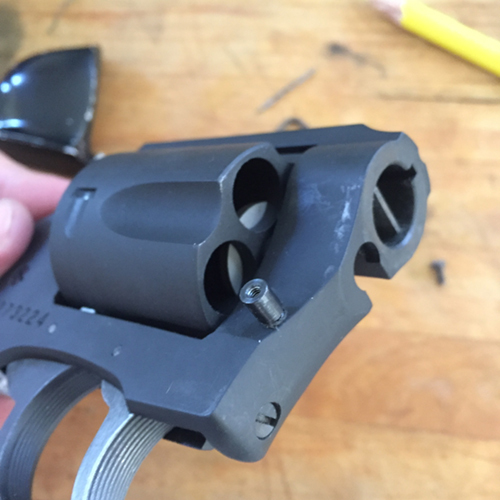 I'll need to drill a small hole through the steel barrel so that I can get some muzzle flash from the caps, so I guess I need to make a friend with a lathe. Also took it as an opportunity to try and refinish my Tomen receiver. It's no Nobu, but I feel like I'm starting to get the hang of how these chemicals work. What a great project! Nice work! Thanks! I just kind of stumbled into it, but it should help me pick up a few skills for sure. Just need to get access to some real tools! Wish I could get that cap firing gun here in Canada, super jelly. 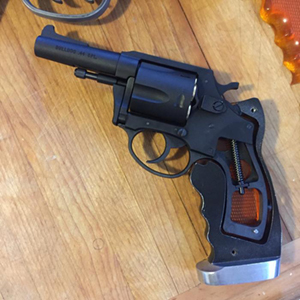 I collect plug-fire model guns, and a little while ago a company put out a Charter Arms Bulldog. And what company might this be? Oh sorry, their name is in the thread title, but I forgot to point it out. CAW, or Craft Apple Works. They're a very solid modern model-gun company. Tiniest of updates. 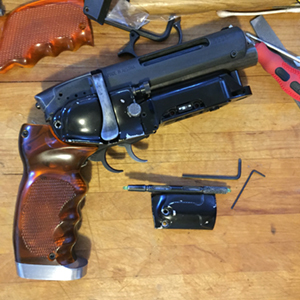 I drilled into the receiver. 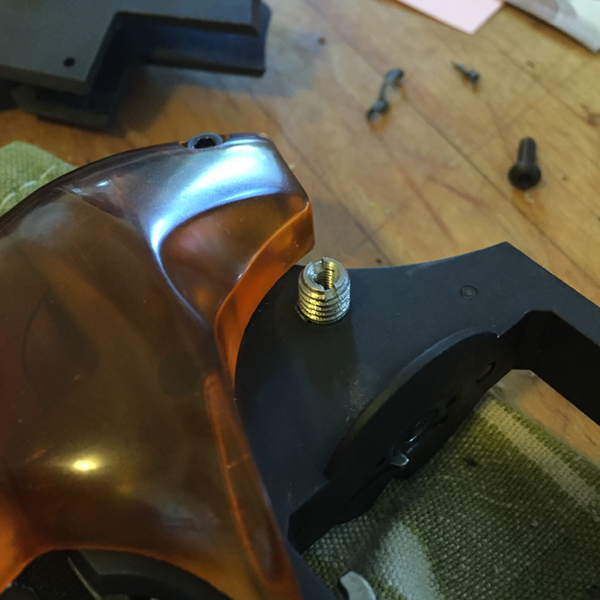 Installed the standoff that serves as the shared mount for the right side cylinder cover and the Steyr mag. 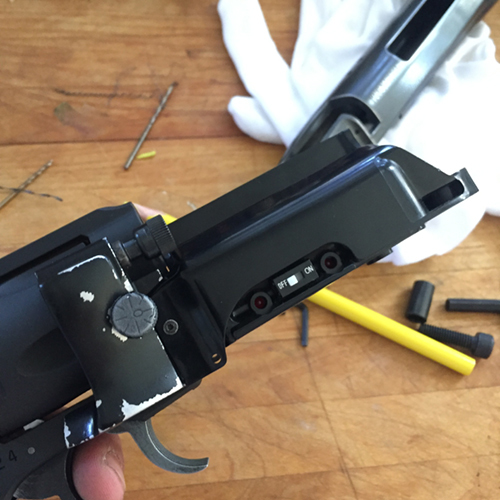 I just used the standoff with the allen head screw that threads into it as a tap. Went slow and eased off every time I felt too much tension to clean off the threads. Totally worked, though! 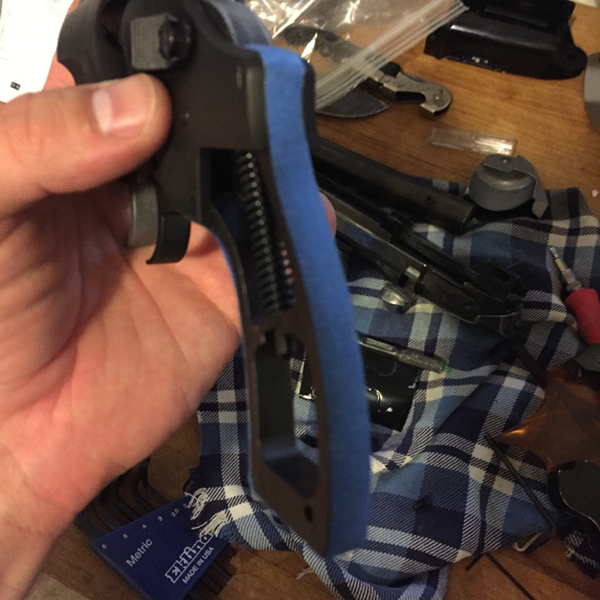 Got the grip frame sorted today. Almost bricked the project a few times. I only have a hand drill (and no taps!) so this probably should have waited... but I'd had a beer and was feeling confident -- what could possibly go wrong! To register where the mounting screws would go, I masked the outside of the bulldog frame and then lined it up where I wanted in the outer frame. I don't have too many pictures of this sadly, but I essentially shoved a marker through the holes where the screws would normally go and used those as my drill guides. Here's a totally unhelpful picture from before I marked or drilled anything. 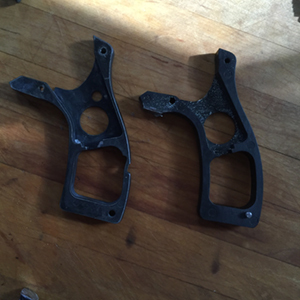 To tap the holes, I chucked up the screws in my hand drill and just drove 'em on in. Not recommended, but I really wanted to make some more progress today. Anyhow, hey it worked! The grip angle is slightly off. In fact clearances for the cylinder release were pretayyyy tight. 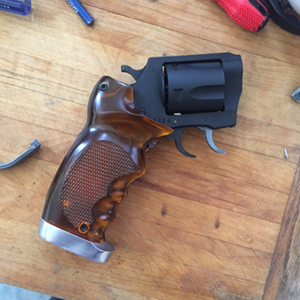 In fact I had to shave the little nub on that grip down just a little to make the release slide easily again. Things are going to be pretty tight with the left-side cylinder cover as well, but I think I'm going to be ok.
Usually when I reach a point like this, where I've almost nuked a project but managed to come out the other side unscathed I stop. Not today though! After a brief time trying to use the cylinder arm of the bulldog - only to start pulling my hair out trying to get the registration right for the right-side cover - I decided to just use the arm from the Tomenosuke. It's not a perfect fit, but after I sanded down the diameter of the part that slides into the cylinder it actually worked just fine. It seems to open a little further than the Tomen did... or I'm just crazy. Cool! Almost done! With any luck I'll actually finish this thing soon! 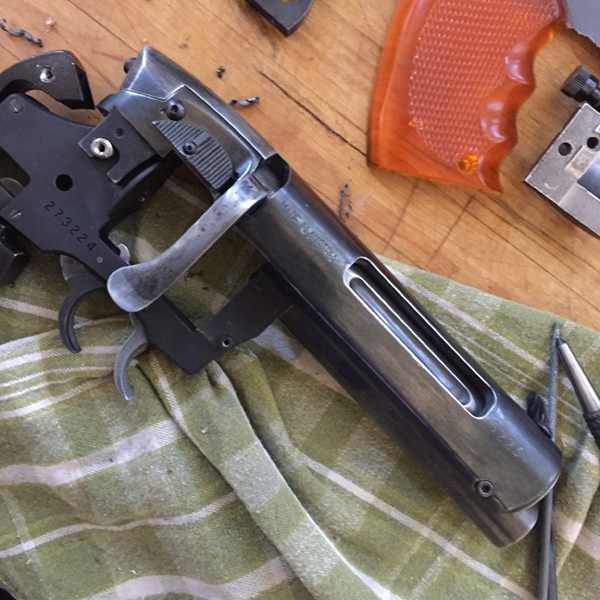 All that's left is the trigger-guard and anchoring the top receiver / left-side cylinder cover. 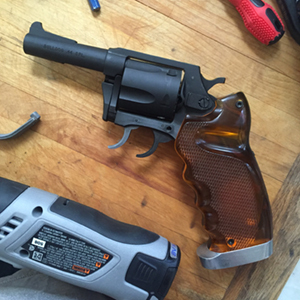 Oh, and I gotta drill a hole through the barrel for that muzzle flash. Still, the grips were actually the scariest part of this whole thing for me, so having that over is huge. More soon! That's looking pretty sweet. I can certainly sympathize with the "bricking" bit. There are just some steps you know could spell disaster if/when they go wrong. Thanks for sharing this project and good luck with the rest! I guess this build is something we've never seen before?! Yeah I guess so. There was a plug-fire blaster put out a little while ago, but I don't know what the construction was. This project is fun because it's kinda like a live fire build, but way less involved lol. Liking what you're doing with that CAW. Eager to see the next update! Nice video! That really is a cool base for a blaster build, and you certainly picked a fantastic kit to finish it. Looking good! Alright, home stretch as far as construction goes. I was having a hard time finding exactly the right size standoff, but then I had a brain wave. Just use an M6 male to M3 female threading adapter. 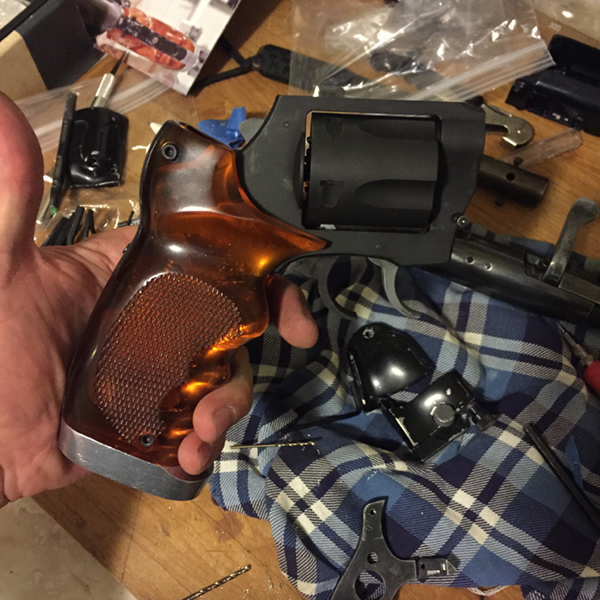 All I have left to do is get the trigger guard installed, and drill out a hole in the barrel. Thennnnn I'm gonna experiment with finishes, though. I know you can do a lot of cool stuff with the heavy-weight ABS. 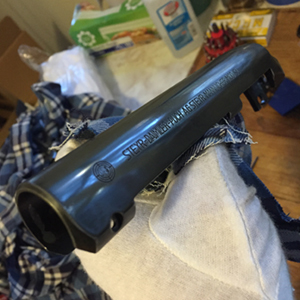 I also tried to deepen the really nice blue finish I had on my receiver, but only ended up messing it up. 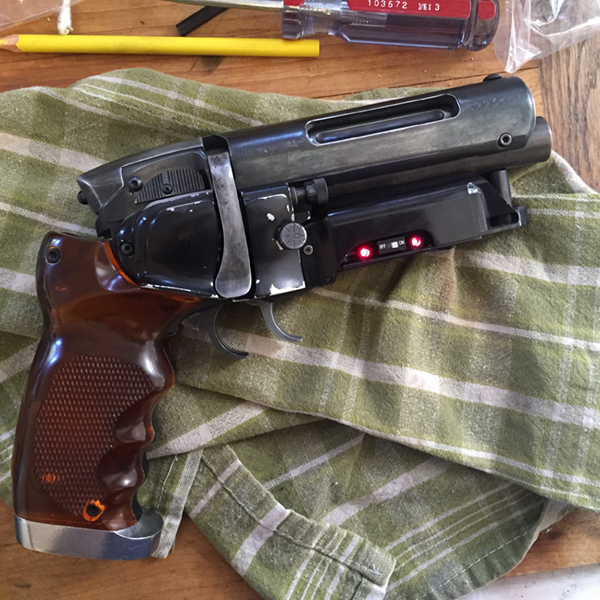 I might redo that too, although that would be the fourth time I've sanded the receiver down in its lifetime. The etching still seems deep enough, though, so maybe I'll go for one more try. Anyhow, that's all I've got for now. Which version of the Tomenosuke are you using? I finally got around to building my Tomen kit and the grips are a lot more yellow than yours which appear to have that coveted "root beer" colour. It's the "Blaster Pro Assembly Kit" version. I got it second hand last year, but I'm pretty sure all the parts were original (except for the ones that were missing ). 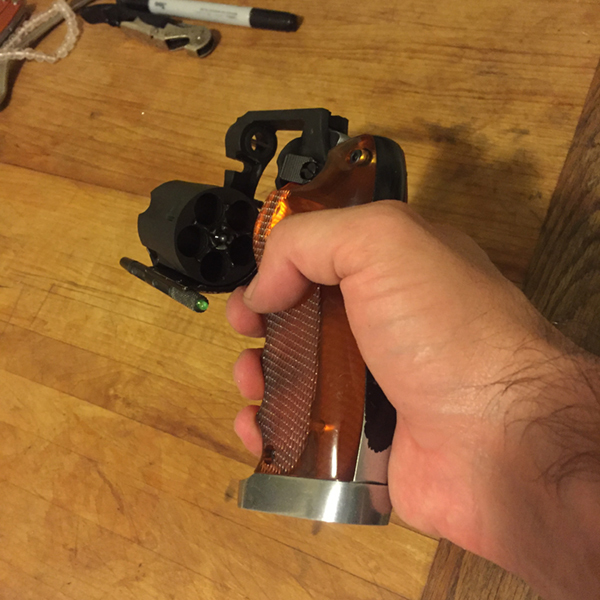 I think most of the later kits have had the amber / root beer grips. It's coming together nicely. I like your solution to the stand off problem on the back of the cylinder cover...clever. I watched the new firing video and I'm anxious to see what it looks like when things can come forward through the barrel. Keep up the good work! Thanks Dana! It certainly hasn't required as much work as a Coyle / Sid, but it's had it's own unique challenges that have had me sweating bullets all the same. I'll definitely have some videos up once the whole thing is finished. 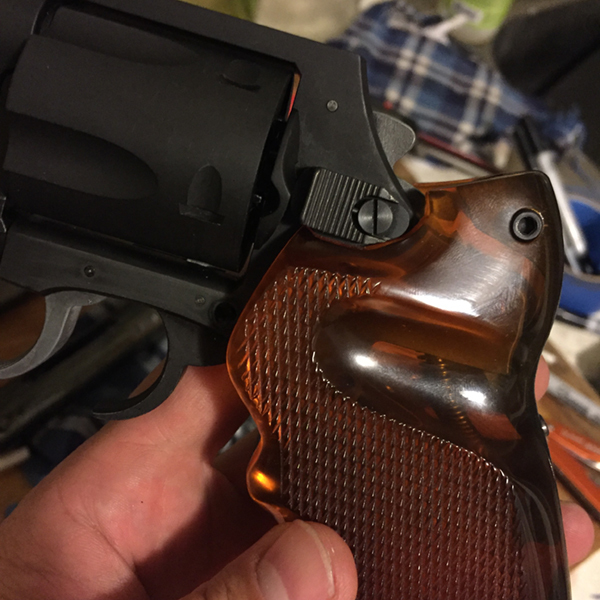 Model gun guys usually augment the cap charges with flash cotton or stuff they refer to as "prop powder" which is pretty much just a metal powder + oxidizer.